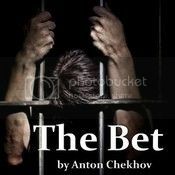 "The Bet" is one of Chekov's most anthologized stories. A rich banker makes a bet with a poor artist that he cannot voluntarily stay imprisoned for a long period of time. The result of the bet is quite different than either man could have supposed. To prove which is a worst way to die, capital punishment or life imprisonment, a banker and a lawyer enter into the bet: the lawyer agrees to imprisonment for fifteen years in exchange for 2 million. He can have as much wine, tobacco, and books, but will have no contact with any person for the fifteen years,being confined to a room in the banker's home. If the lawyer leaves the room for any reason, he forfeits the 2 million. The banker doesn't think he can do it; the lawyer is confident that he will. Fifteen years pass, and what both men have discovered in that time has changed them both in equally dramatic and unexpected ways. The story may be short, but it is powerful. It is amazing how Chekhov can create such an interesting character study in such a short work of fiction.